My first visit to Italy and my first stop is Venice. We arrived at Marco Polo Airport in the late afternoon and caught an Alilaguna ferry to Piazza San Marco. The Piazza was near our hotel, so I thought, and it was a good landmark to get our bearings. The day was nearing sunset when we left on the vaporetto to San Marcos Plaza. After a 14 hour flight, the boat ride was relaxing. Venice harbor with a beautiful sunset as a backdrop can mesmerize and excite you at the same time. Boat traffic was light except for a monstrous cruise ship heading out to sea which looked out of place near this old city. 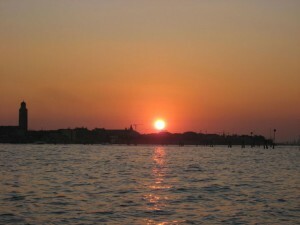 The setting sun highlighted the lagoons natural beauty and made the water taxi ride into Venice much more memorable. It was dark by the time we arrived at San Marcos and started looking for our hotel. All of the travel books are accurate in saying it can be confusing walking around Venice for the first time. Most streets are not marked and once you start winding through the streets it can be challenging to keep your bearings. Markings on building are hundreds of years old and many are illegible. The canals are the streets, so addresses and signs are posted for that type of usage. 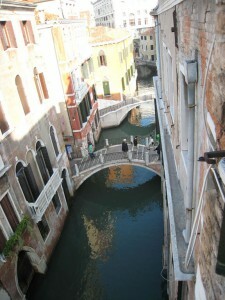 But this is why we love to visit Venice, to wander its maze of tiny streets and canals. It’s all part of the adventure. Arriving at San Marcos Plaza as a starting point to get to our hotel was a mistake. I learned later, that we should have got off the vaporettos at the Rialto stop which is much closer to the hotel. We ended up walking around more than we needed. Finding the hotel became more time consuming then expected. The street our hotel was on actually was a small alleyway. We walked right past the small walking street which led to Hotel Centauro. If I had taken a step into the alley, I would have seen the hotel sign at the end of the alley. So close, yet so far. Sometimes, when you’re tired you miss details or clues that could have helped. No panic, more adventure, somehow it all works out, and it did. As we stood in Campo Manin wondering were we made a wrong turn, some people nearby recognized our confused faces and knew we were looking for the Hotel Centauro; the same hotel they had trouble finding the day before. It was a refief to find I wasn’t the only one that had difficulty finding this hotel. And how about this, the very next day, we were able to return the favor to a couple of other arriving travelers, who had the same lost expressions looking for the elusive hotel. The Hotel Centauro lacked an elevator and we were on the third floor; however that small negative did not prevent us from enjoying our stay. The hotel turned out to be a very good choice. The Centauro Hotel is tucked away down a very narrow alley near Campo Manin in the San Marcos district, not far from the Grand Canal and the Rialto Bridge. 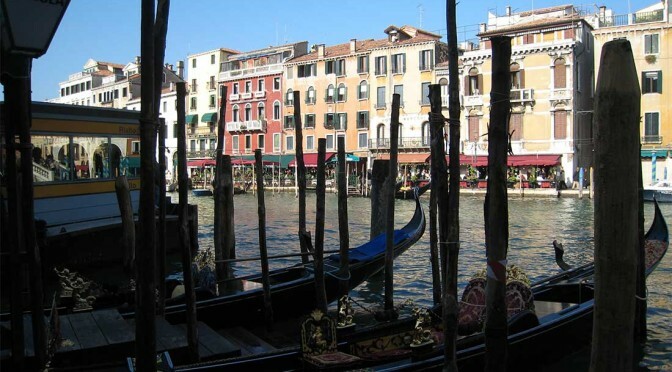 We found the hotel to be an excellent location, and most attractions around Venice are within walking distance. A smaller canal is adjacent to the hotel and our room was above it on the third floor. Being near the canal gave us music and singing from the passing gondolas down below. I really liked this feature, the music added more cultural ambience to our hotel room. Fortunately, the boat traffic in the canal was moderate and settled down at a reasonable hour, so it didn’t interfere with our sleep or comfort in our room. The rooms were small and snug, which is typical for Venice, and all was neat and clean. Every morning there was a well presented continental breakfast with breads, pastries, fruit, cereals, some meats, juices, teas and very good coffee. There is an attendant present to restock the food and make cappuccinos for the guests. All tables in the breakfast area were prepared with clean linens giving the room an elegant look and feel. The staff spoke mainly Italian and very little English, but communication wasn’t much of a problem. Getting situated in our hotel was a relief. The beds were comfortable, and the jet-lag was catching up. We decided to get some sleep, get an early start in the morning, and start exploring Venice. Italy is almost each traveler’s aspiration – it has been on everyone’s travel itinerary for centuries, and with good reason.